Pisces really need to be needed. They suffer from fear of rejection and low self-esteem. Pisceans are tender and caring, but frequently become the victims of domineering and uncaring partners. They submerge themselves in the experiences of their mates. If their partner is strong and caring, the lucky Piscean will soar to new heights. Conversely, if they find themselves in an unfulfilling relationship, they will prolong the agony--feeling they must deserve the misery—-and assume the role of martyr. Pisceans do best when involved with a solid personality who will enjoy their romantic fantasies. There is no more loyal and caring lover than a Piscean, but their need for emotional and sensual reassurance sometimes leads to flirtations. 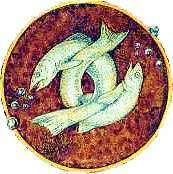 Pisceans are the most loving and giving of the signs, their ability to select an inappropriate partner is legendary. In the right relationship, their sexuality will blossom and become something of an art form, especially as they get a little older, more experienced and more confident. Pisceans are well-suited to careers as veterinarians, biologists, artists, doctors, musicians, psychologists and mediums.